How Many Women Have Served in Congress? Mariana Villa was an HNN intern and a student at Buena Vista University. This article was first published in 2012. It was updated in 2016 by intern Katherine DeFonzo. Montana representative Jeannette Rankin, the first woman elected to the U.S. Congress. Credit: Wiki Commons. Currently there are 108 women in Congress. Eighty-eight are serving in the House of Representatives and 20 are in the Senate. Some simple math -- dividing 108 by 313, multiplying the result by 100, and rounding to the nearest tenth -- equals 34.5. This means that out of all the women that have ever been elected to Congress, 34.5 percent, or approximately one-third, are in office today. Which leads to the question, how exactly did women make it to Congress? 1848 is perhaps a good year to start. It was the year when a group of women met at Seneca Falls, New York to participate in a two-day assembly organized by Lucretia Mott and Elizabeth Cady Stanton. This notable gathering marked, in many ways, the beginning of a 72-year struggle to grant women the right to vote. Victory, however, came before ratification of the 19th Amendment on August 18, 1920. Her name was Jeannette Rankin, the first woman to be elected to Congress. After being officially sworn into office in 1917, Rankin declared, “I may be the first woman member in Congress, but I won’t be the last.” An avid supporter of women’s suffrage, the Republican Representative from Montana actively worked towards her cause, creating a Committee on Woman Suffrage and opening the first House debate on this subject in January 1918. 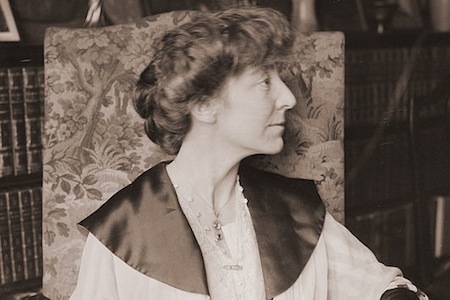 Aside from being a suffragist, Rankin was an avowed pacifist. When President Woodrow Wilson presented a resolution to declare war on Germany, she was one of the fifty House members to vote against it; the resolution passed with a 374-50 vote. In 1941, she would again vote against U.S. participation in war, this time in World War II. Out of the 389 members of the House, she was the only one to do so, making her extremely unpopular. After her term was over, she would not run for re-election in either House. Nevertheless, throughout the rest of her life she continued to advocate pacifism, leading the “Jeannette Rankin Brigade” in 1968 in protest of the Vietnam War. The first woman to serve in the U.S. Senate was Rebecca Latimer Felton of Georgia. Sworn in on November 21, 1922, the 87-year-old’s term in office lasted only one day. The wife of former U.S. Representative William Henry Felton, she had a background in politics and civic affairs. Through her writings -- where she advocated women’s suffrage, Prohibition, and public education, and expressed deeply racist attitudes towards African Americans -- Felton became an influential figure in Georgia politics. Her influence, along with the sudden death of Senator Tom Watson in 1922 gave Georgia Governor Thomas Hardwick an opportunity to redeem himself for his earlier opposition to the 19th Amendment. Appointed to Watson’s seat on an ad interim basis on Oct. 3, Felton was officially sworn into her 24-hour post on November 21 during a special session called by President Warren Harding. The first female to be elected to the Senate was Hattie Wyatt Caraway, a native of Arkansas. After Caraway’s husband, Senator Thaddeus Caraway, died in November 1931, she was offered her husband’s empty seat by Governor Harvey Parnell. After fulfilling her husband’s remaining fourteen months, she ran for re-election and won by a landslide in 1933. A practice, often referred to as the “widow’s mandate,” the “widow’s succession,” or the “matrimonial connection,” has had an essential role in allowing women into Congress. For example, out of the ninety-five women who served between 1917 and 1976, thirty-four (or one-third) were widows who were either elected or appointed to their late husbands’ seats. This practice began with California Representative Mae Ella Nolan, who succeeded her husband in Congress, serving from 1923 to 1925. Having acquired extensive experience from their spouses’ careers, these congressional widows often made able replacements for their late husbands. It should be noted though that the majority of them often served for one term or less, primarily seen as temporary placeholders until a replacement, generally male, could be found. Of course, there were notable exceptions, like Edith Nourse Rogers, who assumed her husband’s seat in 1925and remained there until 1960, making her the longest-serving woman in congressional history. Hinging on this precedent, the doors of Congress were opened to women like Mary T. Norton, a representative from New Jersey who advocated the passage of the Fair Labor Standards Act of 1938. This act, which was part of President Franklin Roosevelt’s New Deal reforms, called for a 40-hour work week, outlawed child labor, and set minimum wage at 25 cents an hour. She would serve twelve terms in the House, from 1925 to 1951. 1992 has been called by some the “Year of the Woman,” for it more women were elected to political office in November than ever before, five of whom joined the U.S. Senate. One these five was Carol Moseley-Braun, the second African American to be elected to the Senate since Hiram Revels in 1870 and, the first African American woman to hold this post. The first woman of color to be elected to Congress was Patsy T. Mink, a Representative from Hawaii, in 1965. However, chronicling the influence that all elected women have had in the United States Congress is impossible to do within this mere article. Books like Women in Congress, 1917-2006 and its companion website provide an extensive history of all the women that have served in Congress since Jeannette Rankin in 1917.